Tune in this Wednesday evening to this week's Musician's Show when we sit down with the renowned pianist, George Cables. He will stop by the station before performing a series of shows in tribute to Dexter Gordon at Dizzy's Club Coca Cola at the end of the month. 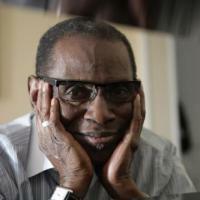 George Cables was born in New York City on Novemember 14, 1944, and began playing classical piano as a youth. Soon after attending a high school for the performing arts, he became turned on to jazz, inspired by the likes of Miles Davis and John Coltrane. He went on to attend Mannes College of Music for two years, and began playing the group, The Jazz Samaritans, in 1964 with Billy Cobham, Lenny White, and Clint Houston. He finished out the decade performing with Max Roach, Art Blakey and the Jazz Messengers, and Sonny Rollins. He then moved to the West Coast jazz scene, where he played with Joe Henderson, Woody Shaw, and Freddie Hubbard. In 1977 he was asked to join Dexter Gordon's quartet, and shortly after he became Art Pepper's favorite pianist, creating a longstanding relationship with him. Over the years he has performed with many other notable musicians, like Sarah Vaughn, Dizzy Gillespie, Tony Williams, and Roy Haynes. So listen to him choose tracks and discuss his career's past and future with jazz this Wednesday on 89.9fm!